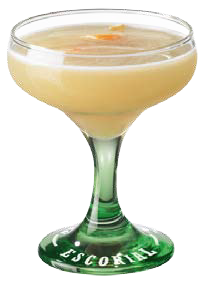 The Cocktail Lilli Marlen is a special and interesting cocktail containing Escorial and the German brandy Asbach Uralt with some lime. Now that the name Lilli Marlen is dedicated to this cocktail I want to tell you where that name comes from. Lili Marleen is a song that was sung by Lale Andersen, released in 1939. It sold s1 Million times, and became classic song amongst the German soldiers. - Press ginger gently into shaker, add ice cubes and all other ingredients and mix it thoroughly. - By using a fine sieve strain it into a cocktail glass that had been cooled. The photo shows a special Escorial glass. - Decorate with a hint of grated organic orange peel.